A Primer: What’s Going on with Part-time Work? Part-time work—by definition, working less than 35 hours in a week—rose fairly steeply in the recession, but has remained roughly flat for the last five years. Currently, part-time employment makes up 19 percent of total employment, compared to 17 percent before the recession began. People who work part time for “noneconomic reasons.” These are workers who work part time by their own preference, because they want or need a part-time schedule given other interests or obligations. This is often referred to as “voluntary” part-time work. Most part-time work is voluntary. Before the recession, 82 percent of part-time work was voluntary. Due to trends discussed below, that dropped to 66 percent in the immediate aftermath of the recession, and has since been recovering. Currently, 72 percent of part-time work is voluntary. People who work part time for “economic reasons.” These are workers who want and are available for full-time work but have had to settle for a part-time schedule, because their employer doesn’t give them enough hours or because they can only find a part-time job. This is often referred to as “involuntary” part-time work. The figure below shows trends in full-time, voluntary part-time, and involuntary part-time work in the recession and recovery (specifically, it shows the growth rate in each type of job since December 2007, the official start of the Great Recession). Two things jump out. First, voluntary part-time work—part-time for noneconomic reasons—follows the same general trend as full-time work. Both full-time and voluntary part-time work fell dramatically through early 2010, and have made slow but steady improvement since then. It makes sense that full-time and voluntary part-time employment follow the same general trend, since they both represent jobs people want. This means they drop in recessions and increase in expansions. It should be noted that voluntary part-time work has increased faster than full-time work in the last two months. That could be a fluke of a volatile series, or it may be the effect of the Affordable Care Act. People may now be able to choose to work part-time because they no longer have to rely on full-time employment to obtain health insurance. That’s a good thing. Second, involuntary part-time work—part-time for economic reasons—follows the opposite trend. Involuntary part-time work is by definition something people don’t want. This means it rises during recessions and falls during expansions, the opposite trend of full-time work and voluntary part-time work. The trend in involuntary part-time work is more dramatic than the trends in full-time and voluntary part-time work, but they all follow the broad contours of the recession and recovery, i.e. they all deteriorated in the recession and its immediate aftermath and have made slow but steady improvement since then. 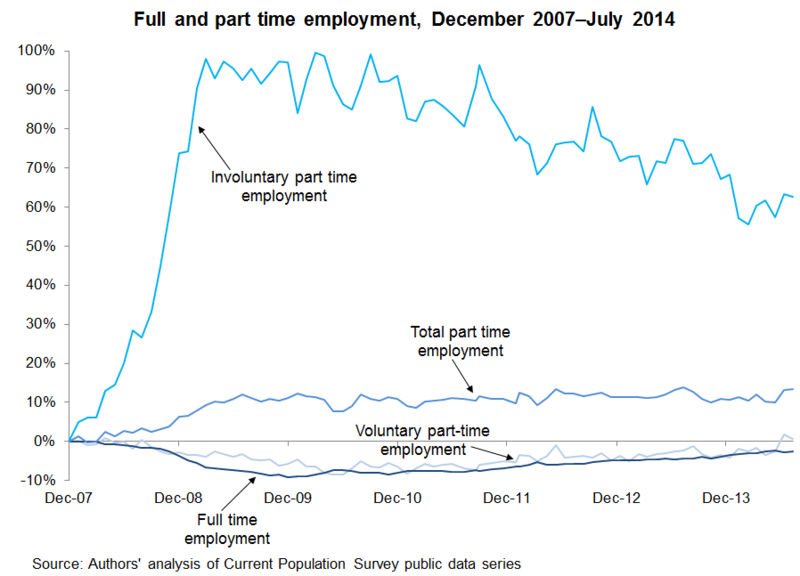 Full-time and voluntary part-time employment are now generally rising, while involuntary part-time work is now generally falling. The net effect of these two opposing trends in part-time employment is that total part-time employment, after rising in the recession, has been roughly flat in the recovery.